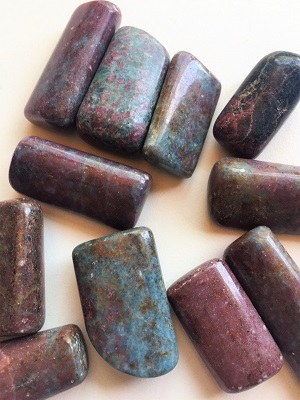 ATTRIBUTES: The crystal combination of Ruby and Kyanite creates an energetic support for the throat chakra, the heart chakra, and the base chakra. Ruby in Kyanite supports speaking from the heart and facilitates the vocalization and resolution of basic difficulties, issues, and obstacles in a loving manner. Working in conjunction with the energy of Ruby, Kyanite produces an energetic vibration that helps to prevent the accumulation and retention of negative energy or vibrations. Ruby produces an energy which is beneficial to the Kyanite, providing one with protection and security. Ruby in Kyanite also assists in astral travel. Ruby in Kyanite is also a useful crystal tool for meditation and accessing the astral plane and when connecting with spirit guides. Ruby in Kyanite is an excellent crystal attunement stone that initiates the movement of Kundalini energies. Ruby is a stone that encourages one to “follow their bliss.” Ruby is an excellent stone increasing life force energy or “chi” in life, as it overcomes exhaustion and lethargy, and calms hyperactivity. Ruby is a sociable stone that attracts sexual activity through its stimulation of the base chakra. Ruby encourages passion for life but never in a self destructive way. Ruby improves motivation and setting of realistic goals and gets “things going.” Given this Ruby's protective effect, it makes you stronger during disputes or controversy. Ruby encourages one to step forward and speak the truth for those who may be threatened. Ruby promotes positive dreams and clear visualization, stimulates the pineal gland. Ruby is a stone of courage, dispelling doubt and relieving anxiety. Ruby inspires one to be who they are supposed to be. Ruby is one the stones of abundance and aids retaining wealth and passion. Kyanite is a stone of connection. Kyanite creates energetic pathways of connection for emotions, mental activities, and learning experiences while assisting in communication between disharmonious groups and people. Kyanite slices through confusion, dispels blockages, illusion, anger, frustration and stress. Kyanite is excellent crystal tool for attunement and meditation. Kyanite is tranquilizing and a powerful transmitter and amplifier of high frequency energies, stimulating psychic abilities, intuition, and enhances one's ability to download information from higher sources. Kyanite crystal connects to spirit guides and instills compassion, grounding spiritual vibrations, and brings spiritual integrity and maturation. Kyanite aids one in seeing what gifts, interests, and skills they have to offer others. HEALING: Ruby in Kyanite has been helpful in the treatment of disorders of the muscular system, throat, parathyroid glands and brain. Ruby in Kyanite is also helpful during detoxification, the treatment of fevers and circulatory constrictions. Ruby stimulates the adrenals, kidneys, reproductive organs and spleen. Ruby is helpful in regulating the metabolism and promoting feelings and appreciation of our physical bodies. Ruby provides support for those recovering from addictions and self-abuse. Kyanite is a natural pain reliever and assists nerves and tissues heal energetically and physically from trauma. Kyanite may help to lower blood pressure and heal infections. Ruby in Kyanite is an excellent stone for amplifying manifestation. Ruby in Kyanite helps with dream recall and promotes dream-solving. In crystal body layouts or healing grids, Ruby in Kyanite gathers and amplifies positive energy flow while aligning the chakras. Lucid dreaming is enhanced when Ruby in Kyanite is placed on the third eye area during sleep. Ruby in Kyanite balances the yin-yang energies. Ruby in Kyanite facilitates the removal of energy blockages and the movement of energies from the ethereal level through the physical body. When placed on the heart chakra, Ruby in Kyanite stimulates and balances the heart. When placed between the heart and throat chakra, Ruby in Kyanite provides a synthesis between the emotional and vocal.